NASA – Latest images of dwarf planet, Ceres, captured by Spacecraft Dawn shows two mystique bright spots on the surface of outermost planet which revolves around the Sun. These new bright spots that are still a mystery, has left the top astronomers scratching their head in-order to find an explanation of those bright spots. The biggest of all heavenly bodies between Mars and Jupiter, Ceres, though not large enough to be called a planet is surely a large asteroid which has evoked a lot of interest among the stargazers, both professional (astronomers) and amateur. For now a dwarf planet, two interesting things in its surface have generated considerable interest- and those are two bright spots on its face. The discovery of those spots has already led the geeks to wonder whether they can be construed as signs of intelligent life, some nuclear testing conducted by a far away species or perhaps something as mundane as the eruption of a volcano on another heavenly body. The mystery surrounding the bright spots on Ceres continues to deepen as a NASA probe gets closer to the dwarf planet. 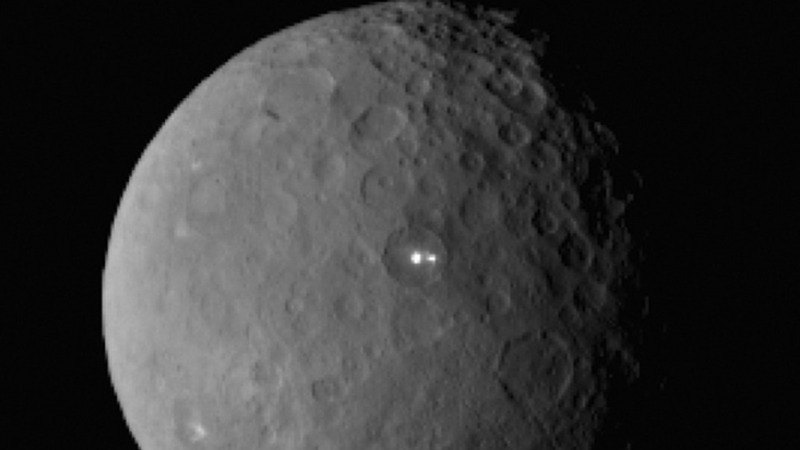 NASA’s Dawn spacecraft is scheduled to arrive in orbit around Ceres on the night of March 5. Pictures sent by it reveal a puzzling bright spot on the dwarf planet’s surface and perhaps a companion too. “Ceres’ bright spot can now be seen to have a companion of lesser brightness, but apparently in the same basin. This may be pointing to a volcano like origin of the spots, but we will have to wait for better resolution before we can make such geologic interpretations,” said Dawn principal investigator Chris Russell, of UCLA, in a statement. The pictures taken by the Dawn on Feb 19 when it was a good 29,000 miles (46,000 kilometers) away from the Ceres are still too distant to give scientists a good look at the peculiar spots. “The brightest spot continues to be too small to resolve with our camera, but despite its size, it is brighter than anything else on Ceres,” Andreas Nathues, lead investigator. The Dawn will reach the Ceres orbit next week after which the probe will spend about six weeks working down to its first science orbit, getting there on April 23. The $466 million spacecraft will then study Ceres from a series of orbits until June 2016. After that, the mission will come to an end.